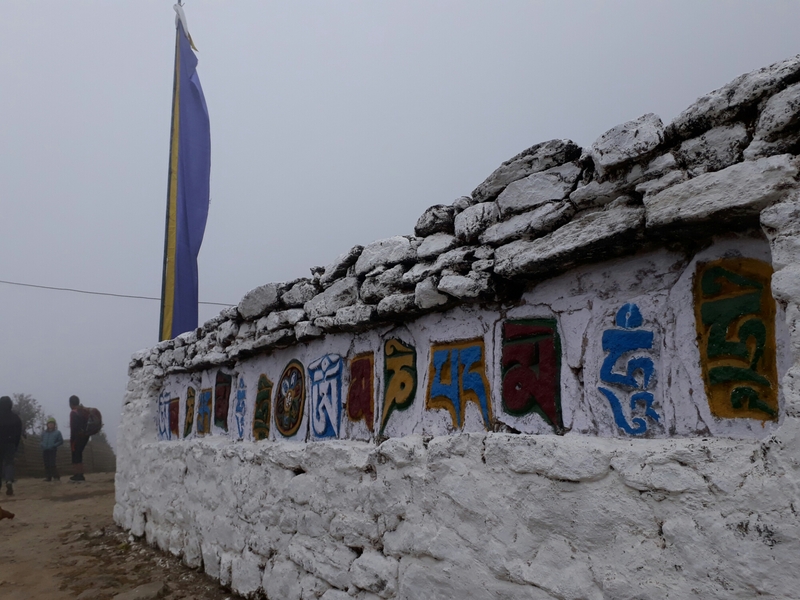 Above, you see one of the countless iterations of the Buddhist mantra Om Mani Padme Hum that we passed on our trek along Singalila Ridge. 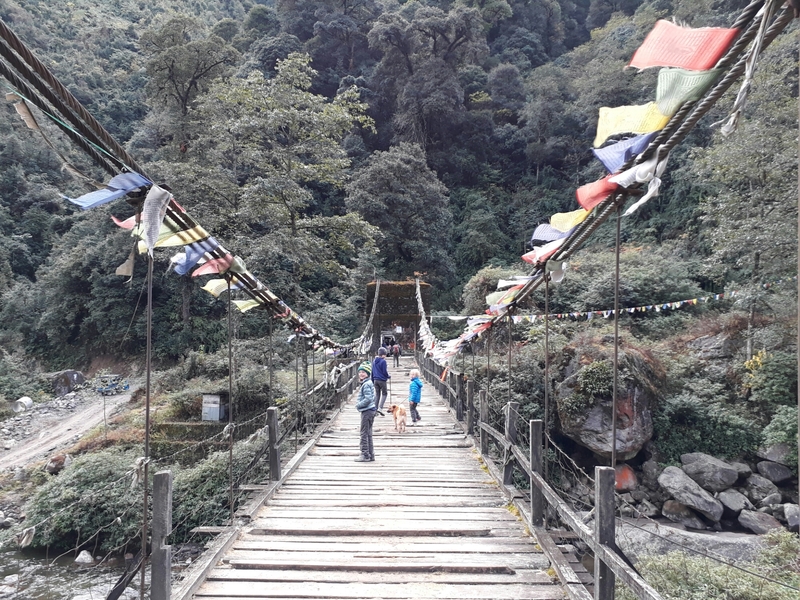 We set off five days ago from the Indian side of the ridge, but crossed into Nepal many times along the way. Each time we re-entered India, a soldier carrying an M-16 recorded every detail from our passports and had each of us, Phoebe included, sign the official Indian Army ledger before we could pass. 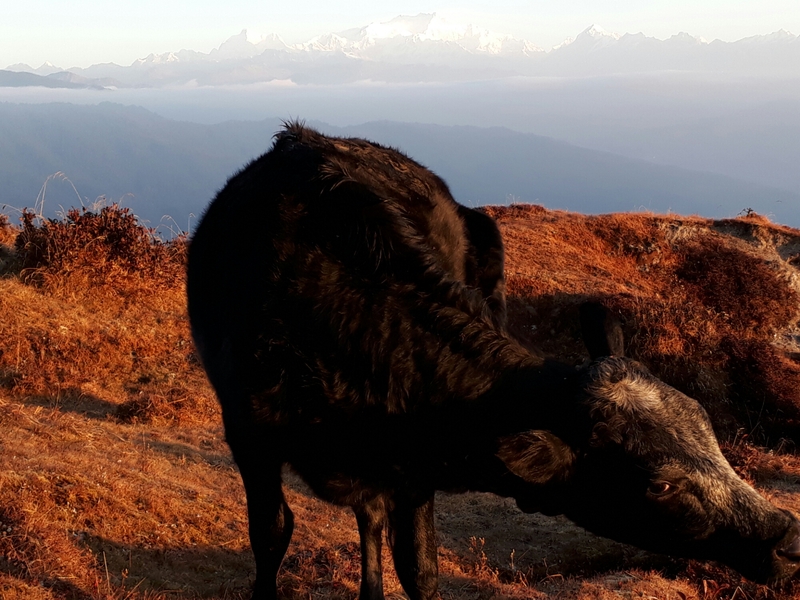 The Nepalese Border Guard apparently had the week off, as we were more often greeted by a chicken or a cow than a human when we walked into Nepal. I am no expert, but my hasty research suggests that a single, definitive interpretation of the above mantra has eluded scholars to this day. 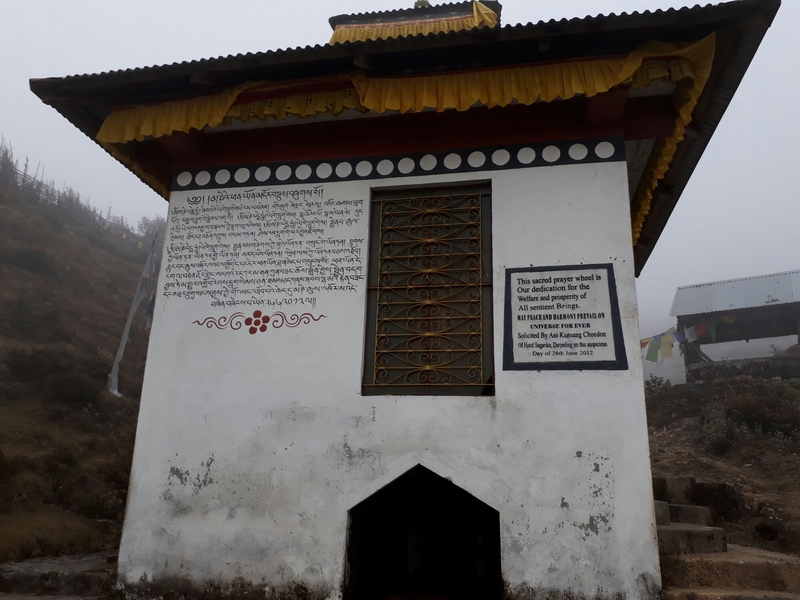 At the same time, this mantra is said to contain all of the Buddha’s teaching within just a handful of syllables. Om itself, a foundational term for Hindus and Buddhists, has hundreds of meanings, the most common of which appears to be “The Primordial Sound.” Or the Sound of One Hand Clapping. One researcher has determined that the frequency of Om matches that of the rotation of our own planet, which is to say that the Earth itself chants Om. Whatever the case, thoughts like these seem much more within reach in a place like the one we’ve just visited than our other stops in India. From 11,000 feet above the sea on a Himalayan ridge, the grime and sonic clutter of Delhi and the Rajasthani markets and streets, not to mention an emergency room in Agra, are a long way away. Kerala, where life seems to move at a slower pace, may have offered a sample or two of the Primordial Sound. Floating on the backwaters of Alleppey, as much a tourist staple as any in India save for the Taj Mahal, one could easily slip into an Om-powered trance. 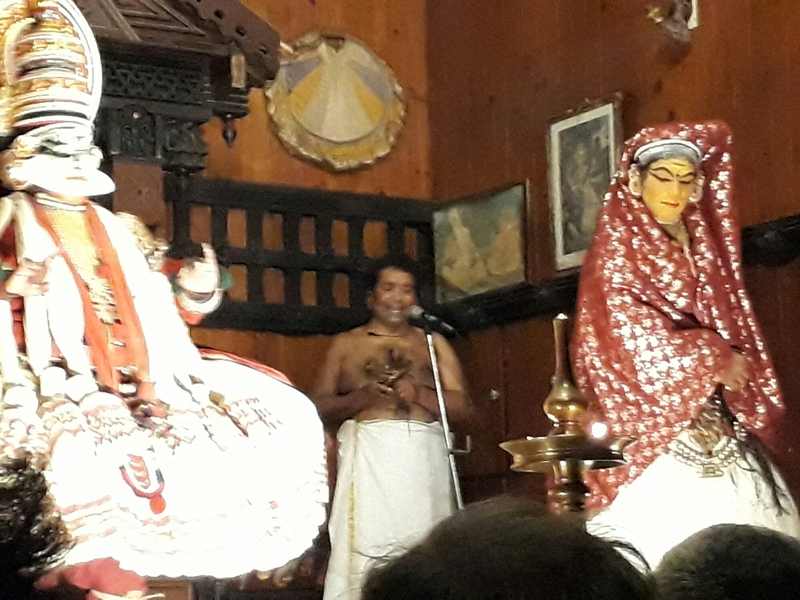 In Fort Kochi, we attended a Kathakali dance performance where the MC flipped a switch on a small black box that produced a fabulous sitar-like drone to support his own chanting and the dancers’ dancing. An admirable attempt at The Sound of the Universe. Wish I had a better photo. There was silence to be found in Goa, but it came in the form of surly Russians who wanted no part of us Loud Americans at a fancy hotel. Back to the trek. Our route covered about 35 miles over 5 days, starting at 6,000 feet. 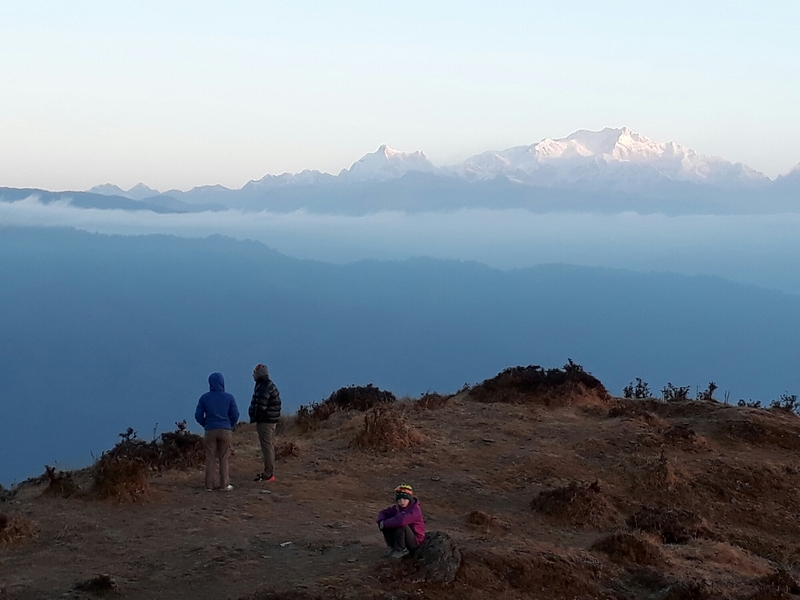 We followed the Singalila Ridge northeast from Chitrey, always in the direction of Kanchenjunga, the third-highest peak in the world. 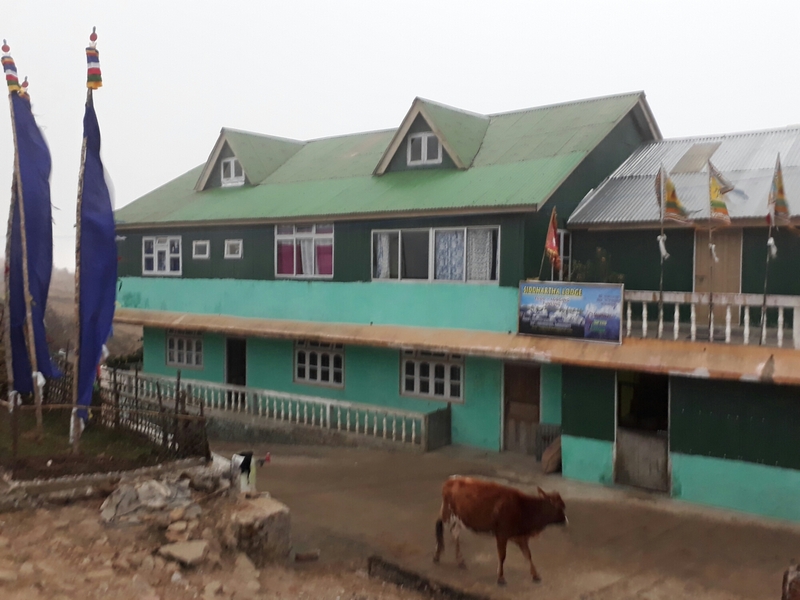 Our highest point was about 12,000 feet, where we slept at a spectacular spot called Sandakphu. 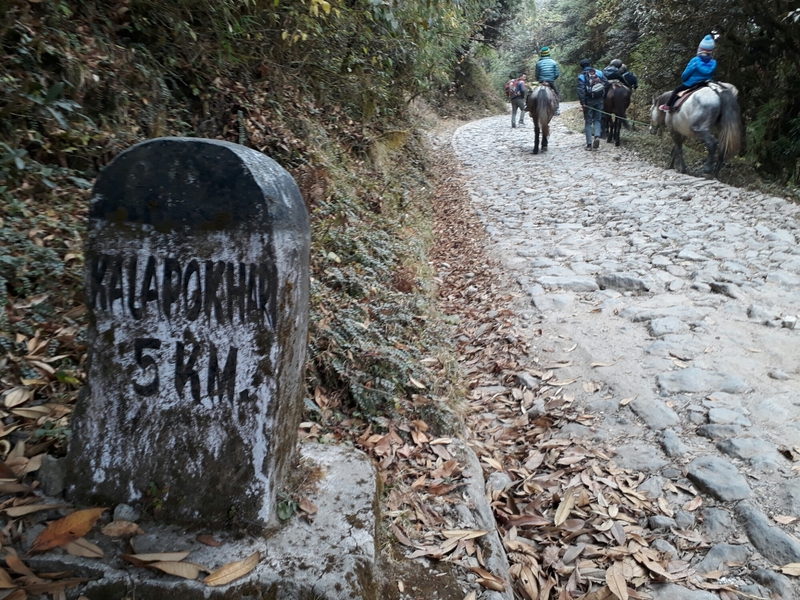 The path was mostly a very rough cobblestone road, and we were amazed to see several jeeps packed with Indian tourists making the drive. We were told later that Bengalis will refuse to walk when any motorized transport is available, and I believe it now. You would have to really hate walking to put up with that drive. We were lucky to have our guide, Santosh, and three ponies to lighten our loads and carry the occasional kid who needed a break from the walk. We stopped for lunches and for overnights in teahouses along the way. The level of luxury varied, but none offered heat or hot water. A private bathroom was a treat. We were told to lock our door at all times in one place. Food was basic but hot and we were always happy to see it: noodle soup, dal, porridge, hard boiled eggs. And tea everywhere we turned. Moving back and forth between India and Nepal, we found the freedom to be both loud and contemplative. We passed the time on the trail with dozens of rounds of Twenty Questions, and argued over games of War each night in the teahouse dining rooms. We talked about highs and lows of our big trip so far, and the subjects of Home and What We Miss About It came up far more often than in the past. 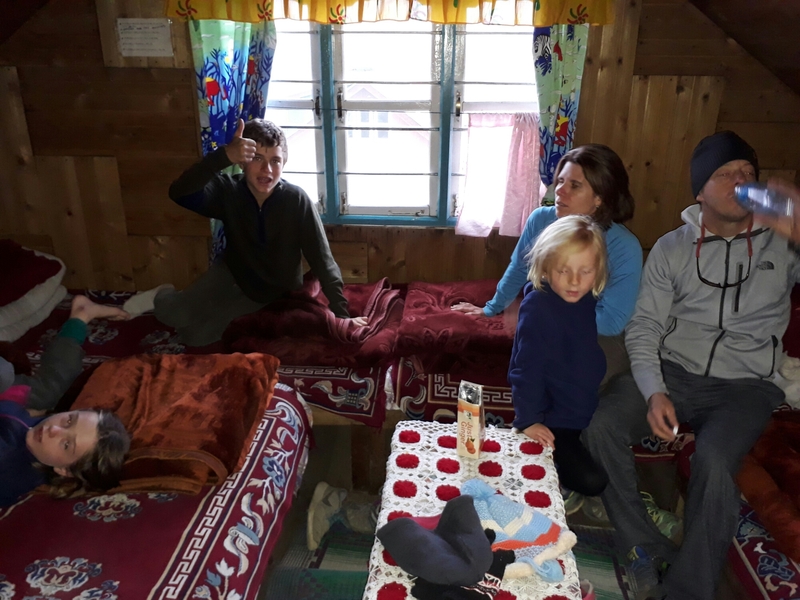 We often slept six to a room and three to a bed to cope with the below-freezing temps and lack of heating. This made it possible for us to pass around Phoebe’s copy of Charlie and the Chocolate Factory, taking turns reading it aloud at bedtime. We experienced high drama when Coco’s pony was spooked by a passing Jeep and almost sent her, headfirst, over a cliff. 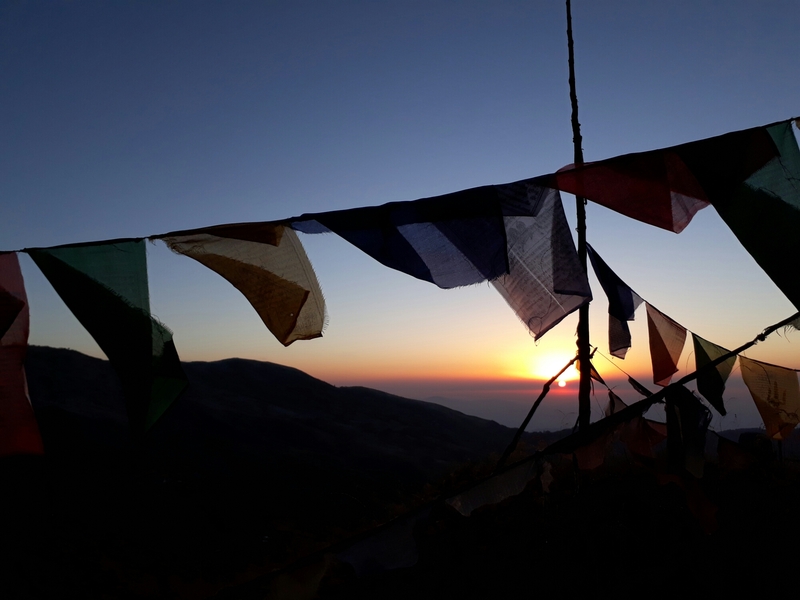 And we woke before dawn to watch in silence as the Sun rose over Everest and Kangchenjunga. It is probably lazy to think that the stillness of that dawn, or the slow whoosh of wind through the bamboo forest on our final descent from Singalila, might represent the Primordial Sound more closely than the insanity of a Delhi intersection at rush hour. The Earth chants Om, after all, not a bunch of cars and rickshaws. But these are all part of life, and certainly all part of India. I’m glad that we’ve been able to see them firsthand. In closing, here’s a shot of Phoebe winding up to whack William with all of her might. 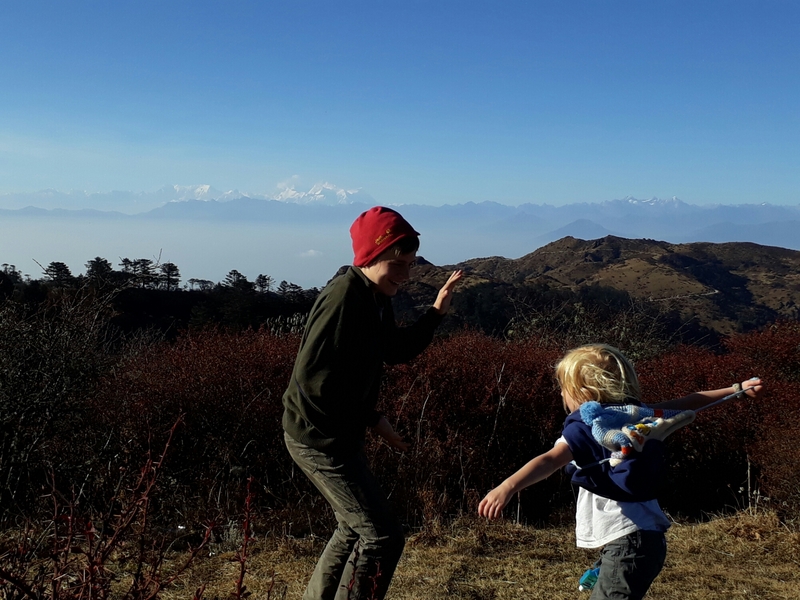 Way off in the background are Everest, Lhotse, and Makalu – three of the highest mountains on Earth. Insanity and the (almost) Primordial, neatly wrapped up in one photo. Beautiful. You are so lucky. Om indeed. Thank you for showing us a little window into your world right now. And the views….stunning and unforgettable. We missed you at Thanksgiving but thought of you all on this great adventure. 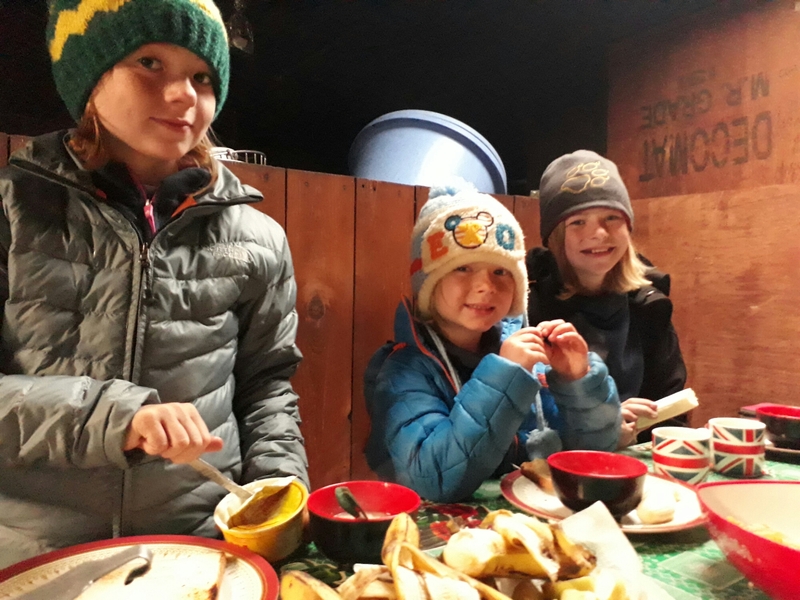 so fun to hear about your travels – what an amazing adventure and experience! Beautifully written – thank you. Nothing like an extended hike to put perspective on things.